Casey Rodgers/Invision/History/AP"American Pickers" can be considered educational TV. 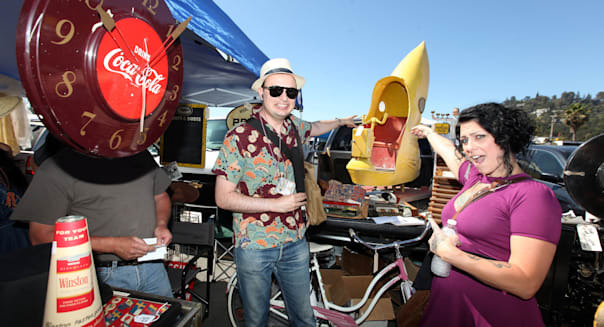 Here's a new defense of reality television: It improves your ability to haggle. According to an online survey by Cincinnati, Ohio-based vehicle lease marketplace Swapalease.com, television shows are playing an increasingly important role in consumers' ability to negotiate the prices and terms of their purchases. After conducting an online poll of 2,500 people throughout North America, Swapalease found that 32.5 percent of men and 78.2 percent of women said television shows including A&E's Storage Wars and History's Pawn Stars and American Pickers helped make them better negotiators. "There is an art to negotiation, and this includes many intangibles such as tone, eye contact and knowing how much your first offer should be. Information on the Internet doesn't specifically address any of these," says Scot Hall, executive vice president of Swapalease.com. "What's interesting is that we're finding through this study that some of today's popular TV shows are in fact filling this void. People are able to watch and observe how other negotiators handle certain pressure-filled situations, and they have been translating that into their own instances either at the dealership or when they're making transactions with other consumers." It's Not Fun -- or Is It? That isn't exactly making it a lot more fun to negotiate, mind you. Of those surveyed, 54.8 percent of men said they don't look forward to environments where negotiation takes place. And 66.7 percent of women share that apprehension. But once you have seen a few people squabble over the contents of a storage space or go hunting for antiques, only to get chased off of a farmstead by an owner with a shotgun, suddenly it seems just slightly less daunting. For the folks at Swapalease.com, that means 64.3 percent of men and 59.6 percent of women now look for ways to negotiate the terms of an auto lease with a previous leaseholder looking for some freedom. That's up from 61.2 percent and 38.4 percent, respectively, just a few years ago. That also makes them more likely to negotiate on items such as cash incentives (which 56.3 percent of men and 32.1 percent of women do) and transportation fees (48.5 percent of men, 52.3 percent women). "Whether it's pricing data, trade-in numbers or even credit scoring, the Internet has equipped a large number of people with the information they need to make more informed decisions," Hall says. "This has certainly helped with their negotiation process, because knowledge is the baseline of power in any negotiation. However, there are still some aspects of negotiation that make men and women uncomfortable that go beyond price and other data points." So which shows really get everyone wheeling and dealing? For 39.6 percent of men and 34.2 percent of women, it's the poor unfortunates of "Pawn Stars." Men, meanwhile, are way more likely to relate to the opportunistic raiders of "Storage Wars" (64.2 percent) than women (29.7 percent). As for "American Pickers," only 38.1 percent of men find inspiration in the hunt for neglected antiquities, while 68.4 percent of women would talk you out of every oil lamp on your property.